Back with his first solo effort in over two years, Kid Cudi gets back to his famously atmospheric style of rap. Indicud is an album that is sure to please the Kid Cudi fanbase. The kid named Cudi has never been one for conformity. Since stepping into the mainstream music spotlight just a few years ago, Kid Cudi hasn't been afraid to push the envelope and experiment with his music, fusing elements of electronic, pop, and punk rock into a sound that ultimately falls under the rap/hip-hop label. This bold approach to making music has created two extreme standpoints for fans. While some laud Kid Cudi as a savior bringing a unique style to a genre they've become bored with, others renounce the unfamiliar sound. One side connects with Cudi's personal stories, while the opposition is annoyed by his sometimes self-loathing lyrics. Indicud is an album that feels right at home in Kid Cudi's discography and isn't likely to sway a listener from one end of the spectrum to the other. Back with his first solo effort in over two years, Kid Cudi's Indicud gets back to the eclectic sound displayed on the first two entries of the Man on the Moon series. Cudi knows how to make a deeply atmospheric album. The heavy drums and melodic synthesizers take you on a guided tour through Kid Cudi's mind. The energy and tone of Indicud is a bit lighter than Cudi's previous two albums, but the dark, signature sound is far from absent. A number of tracks have a very mellow, and somewhat brooding style, such as "Lord of the Sad and Lonely" in which he addresses the fans who have been in the same position as him. Indicud shows a proper balance of light and dark, though. The first full song of the album is "Unfuckwittable", pushing an image of empowerment into the uplifting anthem "Just What I Am" that follows. What makes Indicud different from Kid Cudi's previous efforts is that he handled the production almost entirely on his own. Cudi has apparently taken the familiar sounds he has used while collaborating with producers in the past and found a way to master it himself and put his own spin on things. It's an impressive task, especially considering that you've never seen Scott Mescudi listed by himself in the production credits of a song. In fact, the beats on this album are solid at the very least. It's nice to see the diversity in Kid Cudi's game, and it'll be interesting to see how he flexes his production skills in the future. It's just a small task that makes it easier to appreciate Indicud as a piece of art, as Kid Cudi had full control over the direction of this album. Kid Cudi has never been the rapper who aims to wow the listener with complex wordplay or overly impressive multisyllabic rhyming. Cudi's charm as an emcee comes from how relatable he is to some people. He has gained a fanbase of people that have experienced similar stories to the ones he tells through his music. Cudi has never been one to put on a show and pretend to be something he's not. On all his albums, now including Indicud, Kid Cudi offers an introspective insight into his emotions through his honest lyrics. Indicud offers some divergence by way of a few guest appearances. Kid Cudi grabs fellow Cleveland rapper King Chip for three tracks, delivering an enticing display of the chemistry between the two. A$AP Rocky joins the pair for one of the standout tracks of Indicud, "Brothers". I wouldn't be surprised if this song is pushed as the album's next single. It has the makings of a hit. RZA makes an appearance on "Beez", a Kid Cudi beat on which Kid Cudi doesn't appear for anything more than a short hook. RZA does his thing with the beat and provides a nice variation in the middle of the album when things might start feeling stale. Many took notice of "Solo Dolo Pt. II" when the Indicud track listing was first released, seeing that Kendrick Lamar would be featured. Like the original "Solo Dolo", the sequel features a sample of the Menahan Street Band, though the beat doesn't turn out all that well. Both Cudi and Kendrick come off sounding out of place on the beat, and Kendrick at this point feels like he's just jumping on a song with anyone who will pay his price, and he's not putting that much effort into any of the verses. 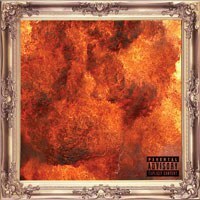 At it's best, Indicud delivers catchy, meaningful tunes with a cinematic quality in the way that the'’re delivered. However, the album isn't able to consistently hold this level of gratification over its entire course. At times, certain tracks dip down from being deliciously ambient to being just uninteresting. While Kid Cudi is a much better producer than many would've expected, he doesn't have quite the same touch that some of the top guys in the industry do. There isn't much progression in the music from the start of a song to the end of it, and while it isn't always a necessity, a lack of much variety becomes noticeable on focused listens. If you've heard a Kid Cudi album before, you probably know what you're going to get from Indicud, and for those who have been patiently awaiting his latest release, that's great news. Indicud features some of Kid Cudi's best songs to date, and is an overall enjoyable listen from start to finish.